Samsung is expected to present another best seller Galaxy S9 early next year. Although official date has not been released, but the device is expected to hit the market in February, 2018. Probable date of release is February 26. Influx of rumours and renders has revealed a design that bears significant similarities with its predecessors, courtesy of “@OnLeaks”. On the design frontier, the only notable changes are on the back, as the front simply thins out the chin and forehead bezels a bit. The back of the device might feature only a single rear camera lens disregarding previous conjecture about two camera lenses after the release of Samsung Galaxy Note 8. Although the larger sibling galaxy S9+ might accommodate dual camera lenses. The new addition to the Samsung flagship family is revealed to render rear facing fingerprint sensor, uncannily similar to Huawei smartphones. It’s still on the back, if this is accurate, but in a more central position that should be easier to reach. 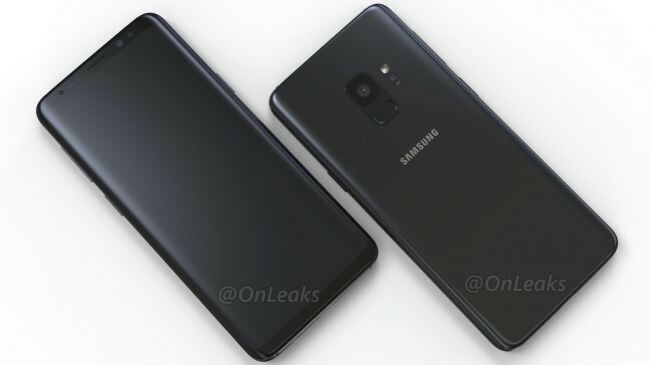 Another rumour has claimed that S9 would be stocked with slightly larger battery than the rest with a battery size of 3200 mAh, which is a 200 mAh increase from galaxy S8. The device might be packed with Qualcomm’s Quick Charge 3.0, whereas Samsung galaxy S8 and Samsung Galaxy S8+ both adorned Qualcomm’s Quick Charge 2.0. Both the pieces of information were shared on Chinese website Weibo, where a user who supposedly is in possession of a test unit shared the above information. Further the new flagship device will have improved camera, revealed through various sources. Even though the surface appearance would not be radically changed, the inside is most likely to be geared up. But we cannot ascertain just yet how much the specifications would differ from the previous product line up, we must wait until more influx of rumours and the official launch. So, are you excited about this new S9 and S9+?